So happy to have Amanda from Handmade Mood back today sharing another amazing project! Hello, again! Amanda from Handmade Mood here, and happy to be back with a spring-y styled post. 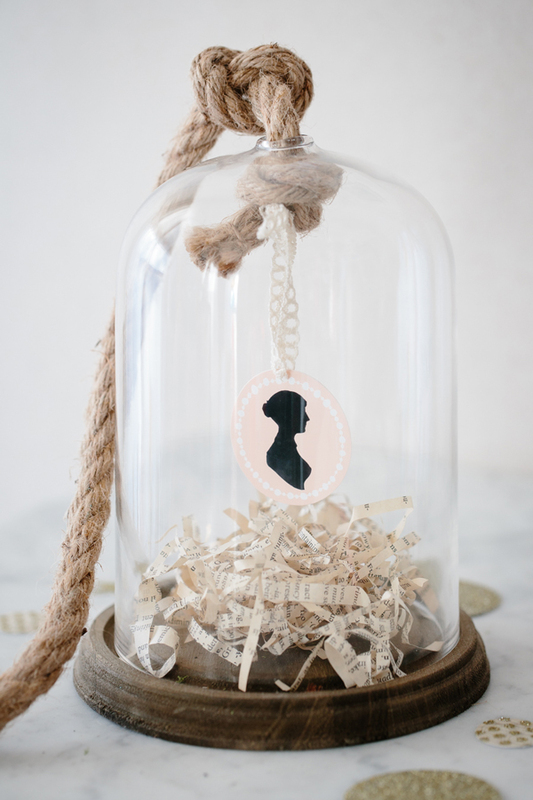 Candice and I are almost obsessed with our cloches and want to share a few ways we incorporate them into our decor. It is universally acknowledged that any object placed under a cloche becomes a work of art. 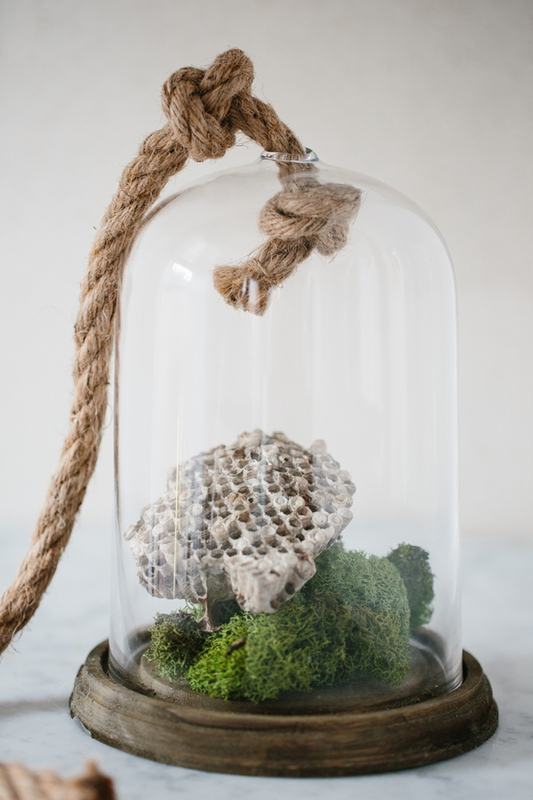 From a simple fern to an intricate diorama - a glass cloche (or bell jar, they're sometimes called) can add a special touch to any season's decor - but we particularly love them in the spring time. Here are 6 ways to easily style a cloche. The size and style of cloche (hear the correct pronunciation here!) will dictate what can be under it. This one perfectly fits on top of several of my favorite cake plates - making it versatile and easy to change up. For Easter, an oversized papier-mâché egg with a gold foil bunny atop a 'nest' of gold shred on a white cake plate. Even flat on the table, a cloche makes a maiden hair fern a dramatic centerpiece. if you have pets (or kids) who can't leave houseplants alone, this is a perfect solution. The fern is sitting in a birch container from a local floral supply shop. After watering, leave the cloche off for about an hour to avoid condensation accumulation. With it's rope detail and wood base this cloche makes it easy to hang something in: from birds to butterflies - or a silhouette of Jane Austen. A little vintage book paper shred on the bottom finishes the look and ties the look together. 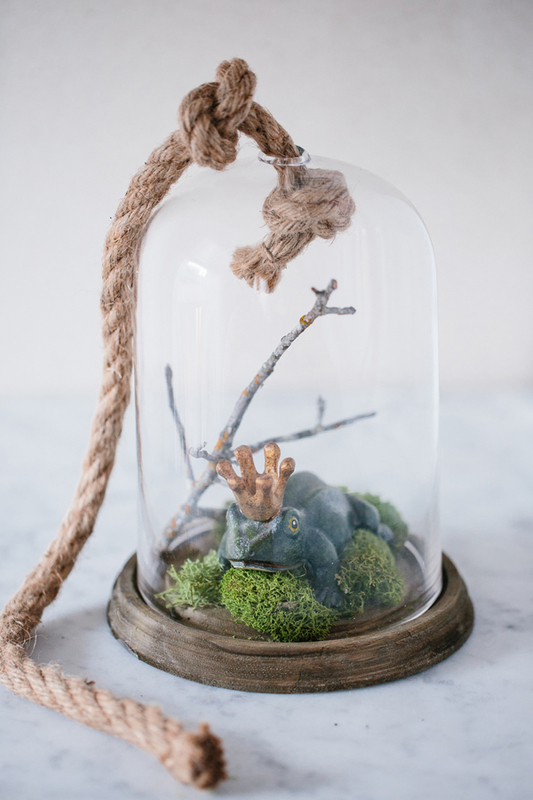 One of our favorite materials to create a base for a cloche display is moss. It looks great year round and is easy to store when not in use. Although there are many kinds of faux moss, preserved moss is readily available at most craft and garden stores and lasts a long time! An oak tree twig makes a perfect addition to an iron frog prince. This reindeer moss is bright green and 'clumpy' making it easy to place. As odd as it might seem, we see wasp's nests (dried up and vacant!) used often in high end decorating and we love the look! Under the cover of a cloche is a perfect place to keep little fingers from damaging the paper thin compartments and provide a wow factor on an entry way or coffee table. For another transitional spring look, we paired a party bunny with some glittered eggs on moss in an aluminum cake plate. The sheet moss works well when it is contained on a piece with a lip and since it can be layered, allows for height variation. We love styling our cloches - the small stage makes us think creatively and makes for a big impact. It's easy to change seasonally and isn't as stressful as a whole mantle! Hopefully, we've inspired you to style something special under a cloche!